Watch, Listen &amp; Win during CW18 &amp; FM102/1's epiCWeek of premieres! 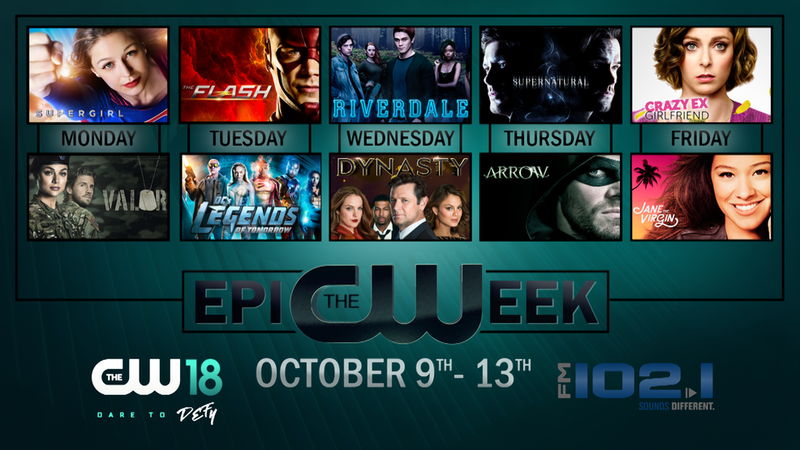 Get ready for an EPIC week of Primetime Premieres on CW18. CW18 and FM 102/1 are teaming up for epiCWeek starting Monday and featuring 10 premieres in just one week. We know that you love CW18's cast of memorable characters, and this season of shows is going to be bigger and better than ever! We have all your favorites back and some new shows that will be sure to please. Each night, watch the premieres of the featured pair for the secret word. Then, listen to Adler on FM 102/1's More Music Mornings the following day at 8:30a for your chance to call in to win an EPIC Prize Pack! The final night to play will be mildly different. On Friday, enter the night's word via the contest portal on FM1021Milwaukee.com as there won't be a call in opportunity. One winner each day will score two VIP Passes to FM102/1's Big Snow Show 12, coming to The Rave/Eagles Club November 30th - December 2nd, featuring Paramore, Phoenix, Walk the Moon, Foster the People, and more! They'll also receive six CW returning favorites' newest DVD box sets, and a $50 Visa Gift Card! Monday, it's superheroism and super soldiers with Supergirl and Valor. Tuesday, teams of superheroes suit up to save the world on The Flash and DC's Legends of Tomorrow. Wednesday, families and friends surrounded by drama fill the evening thanks to Riverdale and Dynasty. Thursday, we're back to saving the world with Supernatural and Arrow. We end the week of premieres on Friday with Golden Globe winners Rachel Bloom and Gina Rodriguez in the delightful dramedies Crazy Ex-Girlfriend and Jane the Virgin. Need we say more?! Get ready for an incredible epiCWeek of Primetime Premieres Monday through Friday starting October 9th from 7-9 pm every night! We're excited and you should be too. What are you waiting for? Get busy watching, listening, and WINNING! It's going to be EPIC!! !